This external analog cable TV tuner doubles as a video up-converter and switcher. Mainly designed for converting RF coax feed, RCA or S-Video feed into high resolution VGA formats for visual entertainment or further A/V broadcast and distribution. The RF input of this TV tuner converter supports worldwide analog RF TV channel frequencies for NTSC, PAL B/G/D/K/I, PAL M/N and SECAM. This coax demodulator is able to decode all standard CATV channels and those satellite receivers with those TV2 out from satellite receivers. This multi-function TV video converter unit supports total of 4 video inputs including coax, composite RCA, S-Video and VGA Input. 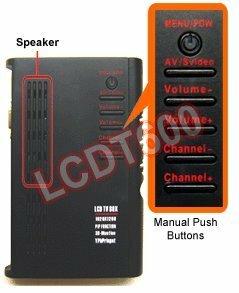 Users can connect various video devices together into this unit as video selector. With the advanced PIP features provided by this TV tuner converter, users can enjoy using computer and watching TV shows or surveillance cam on the same screen. PIP Input Selection: switching between video input video sources (RF input, RCA/S-Video) to be displayed. PIP Window Size: re-size the PIP video window screen at 1/16, 1/9, 1/4 and full screen for display. PIP Window Location: PIP video window can be moved around the computer screen among 5 preset locations. Universal TV tuner design supports worldwide RF frequencies for all NTSC, PAL B/G/D/K/I systems. Easy add-on TV tuner module for all VGA-based monitor or projector without coax input. Decoding RF coax signals from cable outlet, satellite box, RF modulator or CCTV surveillance camera system to sharp VGA pixels for display. 4 selectable video inputs: RF/Coax, RCA A/V, S-Video and VGA pass through. Excellent video to VGA converter for converting interlaced video into progressive VGA type for great video clarity and sharpness. Selectable 10-level VGA RGBHV output resolutions with maximum output up to 1920 x 1200 and 1920 x 1080 pixels. Supports Picture-In-Picture function for watching cable TV or video from a sub-window while the compute takes the main screen. PIP TV video sub-window can be resized from 1/16, 1/9, 1/4 screen or full screen display. PIP window screen location can be re-positioned among 5 preset locations, upper left corner, upper right corner, center, lower left corner and lower right corner.